I decided to spend some time trying to tame my garden. It took a few hours, some major weeding and pruning of my tomatoes but I was happy with the end result. In the end I could see all of my green pepper plants and I smelled like dirt. Whenever I go to pick tomatoes I have to reach into a jungle of branches in order to find any. I always come out smelling like my garden...I am not entirely sure how I feel about it. 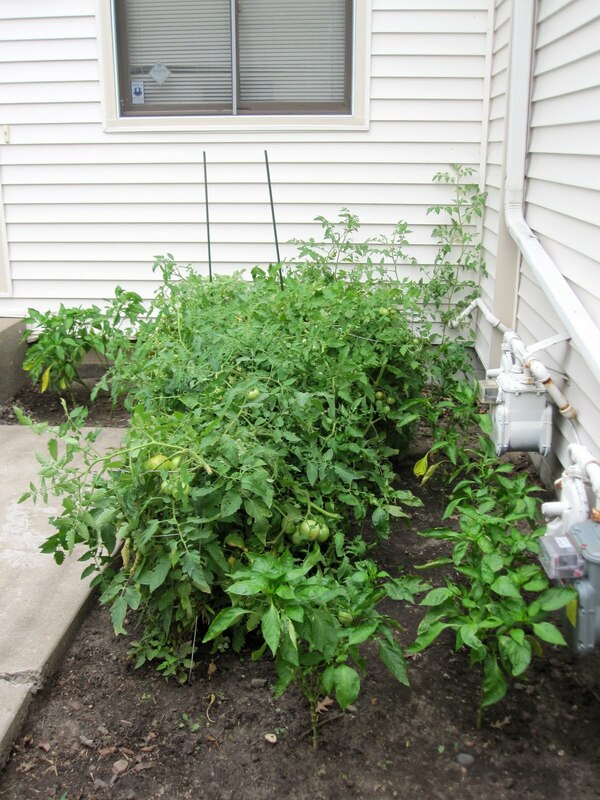 I think I like it because I feel connected to my garden and to the earth, but in reality a tomato plant doesn't make the best perfume! For a little perspective I have included this picture of my garden back in June. 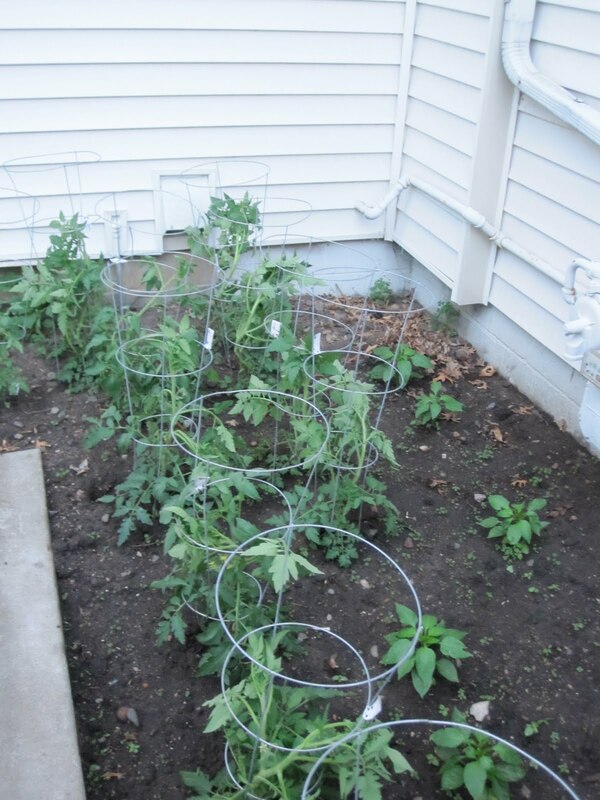 As you can see the small tomato cages seemed like they would suffice. Here is what my garden looks like now, post grooming. 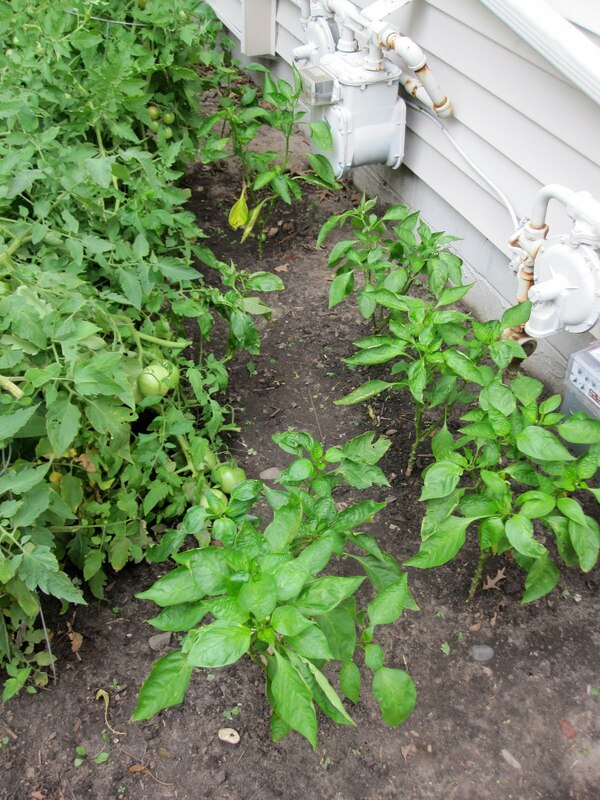 The green peppers now have room to grow without tomatoes smothering them. The plants have swallowed the cages, you can barely see them anymore. I have had to add a few spikes to keep the plants upright. I need to get more. It is crazy how heavy the branches are when they have a few tomatoes on them. I am so sorry that I allowed the tomato plants to usurp all of your space. Now you should have plenty of room to grow, to get water and sunlight. Please forgive me and please make me some peppers now so I can brag about you too! There were many casualties this morning during my pruning. I had to cut a lot of cherry tomato branches as they were growing all over the place and weighing down the other plants. Some of the larger tomatoes fell during my work as well. I saved a few of the big green ones to try making fried green tomatoes. Never made them and I don't have a recipe, but I will try to find one! Anyone have a good one?